Cinemagraphs are eyecatchers on homepages and social media profiles! That's because they're different, being neither photos nor videos. Cinemagraphs turn videos into still photos with subtle motion that feels like magic. 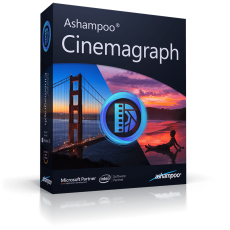 Sure, you can use Photoshop to create them, but why bother with expensive and complicated software when you can create dazzling cinemagraphs in just minutes with Ashampoo Cinemagraph? All you need is a video and, of course, Ashampoo Cinemagraph. The video should contain as little camera shakes as possible, footage taken with tripods is ideal. Ashampoo Cinemagraph then gives you a brush to individually mark portions of your video that should either keep moving or stand still. Size, hardness and opacity are customizable via sliders. We believe, anyone can create stunning cinemagraphs with our software and we stand by that claim! The interplay of still and moving portions inevitable draws the viewer's to whatever motive you seek to emphasize. Through skillful combination, multiple visual layers are possible that make for incredibly vivid photos and looped videos! Though cinemagraphs are always based on videos, your viewers will think you've applied Harry Potter-esque magic to breathe life into lifeless photos - also perfect as a visual climax for your videos or slideshows! You decide which portions stay still and which are animated. The resulting videos create extraordinary moods and are perfect to capture those special moments! Results are exportable as GIF or video files, as needed. Export settings like size, quality and number of loops are customizable in just a few clicks and, if you like to keep the audio, you can do so. The success of every video production largely hinges on the source material. That's why Ashampoo Cinemagraph allows you to quickly adjust exposure and color settings. Fine-tune color saturation, adjust shadows and optimize light conditions in a flash! Use tonal correction and adjust white balance settings to make the most out of your cinemagraphs! Like videos, cinemagraphs can be further polished through special effects or text overlays. Ashampoo Cinemagraph makes it especially easy to add texts or select from 23 effects with six transition effects to set the mood. Both effect strength and transitions are fully fine-adjustable, naturally. Let your creativity run wild and set accents where they'll impress your viewers the most. This cinemagraph software is ideal to capture the perfect moment with excellent positioning and using the best format for the job. Rotate your videos freely, crop to focus on what matters and adjust aspect ratios as needed. Master time and use time-lapse and slowmo effects to vary playback speeds at the click of a button for that extra bit of magic. Naturally, your settings are saveable and reusable later. Camera shakes are the natural enemy of cinemagraphs. But footage shot with cellphones or action cams in particular tends to suffer from a lack of stability. 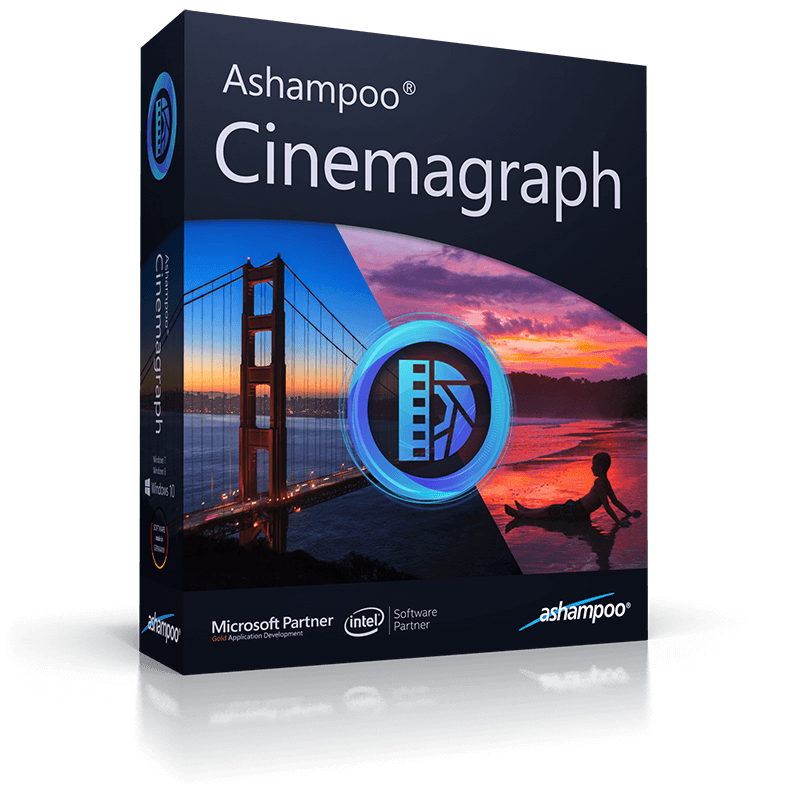 Ashampoo Cinemagraph features cutting-edge video stabilization! Even handheld shots taken in motion become more steady and realistic. Turn videos into vivid semi-still photographs! Create cinemagraphs for free? No problem! Try this Ashampoo product 10 days free of charge and add 20 additional days through a free registration, if needed! Here's your free month of stunning cinemagraphs!